There are many ways to promote your business online these days. Examples are things such as images, info graphics, ads on Google, content, and much more. Out of all of these mediums, video reigns as the king. According to Animoto, an industry leader in video creation, shoppers that view videos are 1.81 times more likely to purchase than non-viewers. We believe that this is because consumers find videos easier to digest, since there is less reading to be done. Also almost 50% of Internet users look for videos related to a product or service before visiting a store, according to Google. mobile-friendly, and video content is being viewed now more than ever. According to Google, in an average month 8 out of 10 18- to 49-year-olds watches YouTube. 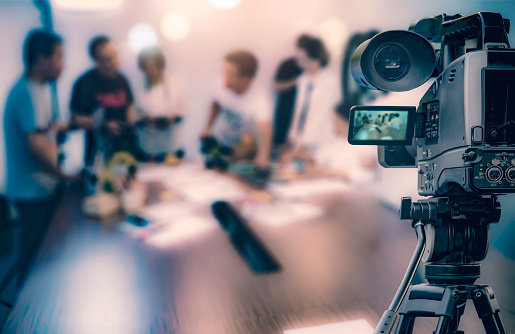 Video has become a popular format when it comes to advertisements as well, on platforms like Facebook, Instagram, YouTube, or even Google AdWords. People now favor video compared to picture or text advertisements, and video has the highest click through rate at 1.84%. Now you might be asking yourself, “Okay, so what? How can I use videos to benefit my business?” There are multitudes of ways. Videos can be used to highlight different aspects of your business such as sales or pricing, the size of your facility, your team working on location, and anything else you can think of. “So I have a video, what do I do with it?” The versatility of videos is another great reason to get started. They can be put on your website, used as social media ads or Google ads, and even cut down to a 30 second TV commercial. So now you might be thinking, “I don’t have a bunch of fancy video equipment or camera to film my business. Is there another option?” To that we answer, absolutely! Envision Marketing Group has all of the necessary equipment to put your business in the spotlight. Whether you’re looking for a commercial or just a quick clip for your website, we can’t wait to help. Learn more about our video product services and our see our video portfolio here.